In my mind, I link the former to ecommerce: Amazon.com (which is US-centric) versus Amazon.de (which is German). If your IP address is coming from someplace in Germany, Amazon will direct you to that domain. This is also known as geo-targeting. There are real differences in law, available products, and shipping, for example, that create the need for separate sites. Usually, sites based on geolocation considerations have different top-level domain names (e.g., .uk, .jp). The second — translating content for non-native speakers — is a task faced by many government websites. It also might be a task for global corporate information-centric (versus commerce-centic) websites. Multilingual content often resides in separate subdirectories; the web site top-level domain name (e.g., .com, .gov) does not change. Be careful not to confuse these two types of foreign-language websites. Avoid merging language choice options with navigation to a specific country site. So how best to communicate language options? Many multinational corporations use a global gateway model because a large percentage of site visitors come from outside their home market. ByteLevel research reported in 2015 that large multinational organizations support, on average, 30 languages. The primary feature of this model is a splash page that forces visitors to make a language selection before entering the site. Let your visitors pick their language and then set a cookie is preferable to auto-detect-selection based on IP address. At first blush, geolocation seems a safe and logical choice. However, the primary language of the country may not be the native language of the site visitor. In addition, a native speaker may prefer to communicate in another language. English may be approaching default ‘lingua franca’ status but that does not mean you should unilaterally dismiss providing translated content. And when you do, let your web site visitor chose which language she wants to read. 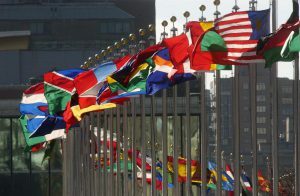 Flags of member nations flying at United Nations Headquarters. Flags indicate nationality, a geo-political unit. Languages, however, cross geographic borders. For example, French is an official language in Quebec, Canada. Would you show the French flag to indicate that language option on a Canadian website? Some countries are polyglotal. Should a Swiss flag take you to a page in French or to a page in German? And there are distinct written and spoken dialects in Chinese, in Arabic, in Spanish (a non-exhaustive list). Flags might be appropriate for geolocation choice, but be careful to avoid visual clutter and too many image downloads. And even in this use case, flags are not a good option if there are more than a few country-specific sites. Text links are easy to create and read, and they don’t require downloading an image. To be effective, the text should be in the language of the non-English reader. If you have a long list of names, you might resort to the two-letter language code. The language icon, developed in 2008, is supported by FontAwesome, which means no image download is required. Although proposed as a solution to the language selection problem, the icon has not gained widespread adoption. King County Elections website language options. As we add more languages, we may drop the English translation or use the two-letter code instead. Although you can add a (free) Google Translate widget to your website or blog and offer a list of languages for automatic translation, beware! The translation may or may not be accurate, and this is especially important if you have legal requirements (government websites). When accuracy is important, hire a translator, someone who understands nuance. 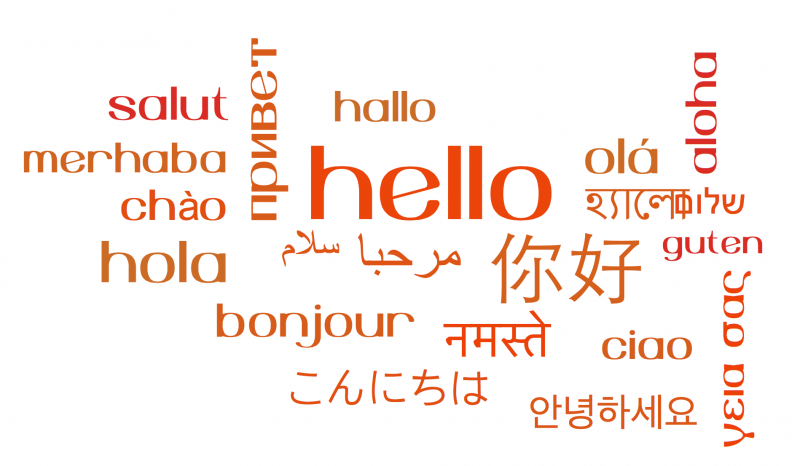 Don’t just hire a native language speaker and ask them to translate! If you do not have the budget for producing multi-media in multiple languages, invest in translated transcripts. One silver lining of this route: the text should also result in better search rankings. Tip 5. Where to put the language choice? The question of choice location is outstanding because there is no de facto accepted location. First, be clear that the choice is of language, not one of geolocation. Second, make the language option visually distinct and put it on all pages: we don’t know what door people will use to enter our site! They could come in from a shared link or a search result that is an indirect route in to the site. Callahan, E. and Herring, S. Language Choice on University Websites: Longitudinal Trends. International Journal of Communication 6 (2012), 322–355. Lee, C. Multilingual resources and practices in digital communication (n.d., book chapter).